For my session at Dev8D I got delegates building a RSS social engagement tracker similar to PostRank (Slides here) [Note to self: Too much coding for the room. Doh!]. Initially I was going to use my Fast-tracking feedback example for this session but forever wanting to make my life difficult decided late on to come up with something entirely new. Part of this decision was influenced by being featured in Mashable’s 5 Essential Spreadsheets for Social Media Analytics (yeah), combined with the fact that my PostRank daily email notifications are broken. For those not familiar with PostRank their service (now owned by Google) would allow you to enter a blog RSS feed and then they would monitor ‘social engagement’ around that feed recording tweets, likes, saves etc. Enter the RSS feed of the posts and comments you want to track, blog address and optionally a comma separated list of Twitter usernames you want to remove from the search. Then open the Script Editor and Run doFeedRank (you’ll need to authorise), finally add a trigger to run daily. 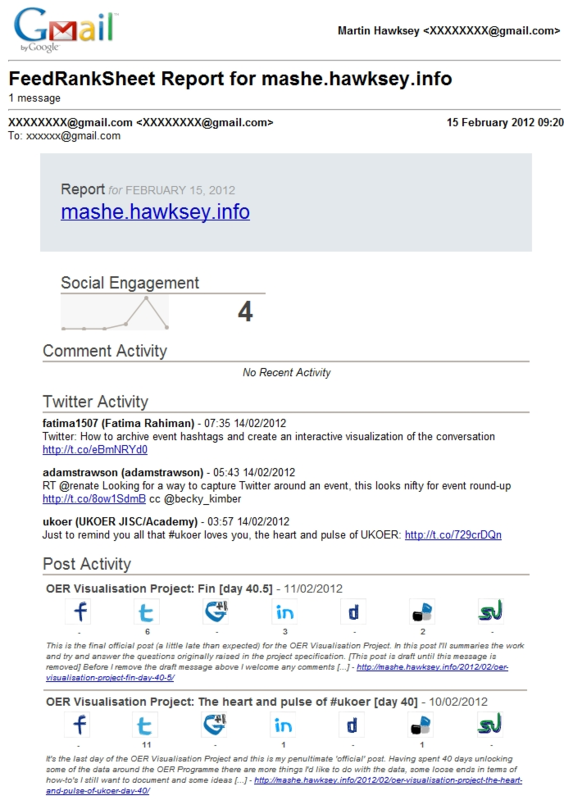 Each time the script runs it gets the latest share counts for posts via the sharedcount.com, combines it with the comment feed and Twitter search results and generated an email to send to designated people (click on image for example output). Most of the script is just data reading and writing. The clever bit is using Google Sites pages as a template for the email. 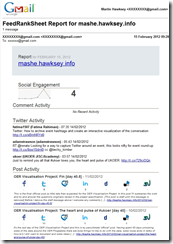 Here is the page for the email wrapper and this page is the post share count template. The thing that really surprised me is that SitesApp.getPageByUrl can get any public Google Sites page allowing you to do Page calls like .getHtmlContent() even if you don’t own it. Exceeding maximum execution – I might need to optimise the code as I was getting timeouts when running as a trigger. I also have a sneaking suspicion that reading the posts from the spreadsheet rather than accessing the raw feed xml using apps script might be a problem. I need to run over a period of time to get data. I really enjoyed the presentation. I am going to make full use of it to do cool things with our data categorisation spreadsheets for support.